Lil Cuete was born in 1984 into a gang infested district of south east Los Angeles. His family is 3rd generation Chicano and his grandfather was a notorious pachuco back in the day. His Grandfather (the original Cuetero) and his uncle (Mr. Cuete) have handed down his legacy as Lil Cuete in his varrio. The hard knock streets of L.A. are where Lil Cuete learned to survive and rise above gang violence through his music. With 4LP's to his credit, since 17 years old, Lil Cuete has built up a loyal following of fans who understand street life because they live it. 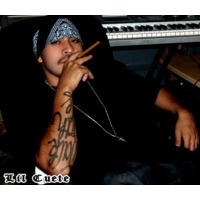 Lil Cuete's music is insightful and real with solid songwriting skills with which he is able to reach out to today's young urban Chicano's everywhere. Real issues, real esperiences, real talent, and real sincerity with a style all his own are what make Lil Cuete a great artist and rapper.